Lack of visibility into inbound product from the field effects sales and slows outbound shipments. iTrade’s Load solution (formerly known as WMS) provides shippers and importers with real-time visibility into packing operations and fresh, inbound inventory. iTrade Field Load enables field operations to send inbound inventory notifications, even before fresh product reaches the warehouse. Trucks and inbound shipments can be tracked in real-time, marking cut-to-cool times and in-transit shipment waypoints. Our in-transit smartphone application allows for product and loads to be tracked while en route by any driver. 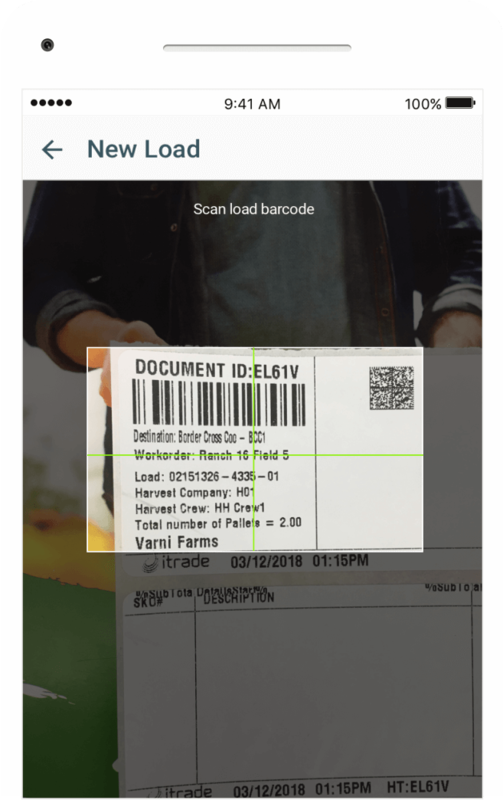 In the field, iTrade Field Load can replace or supplement manual field tickets with real-time electronic records. Once product is harvested, sales and operations teams can monitor field events in real-time through a shared online dashboard. Early inventory visibility allows product managers to prioritize and place field orders for specialty products, while keeping outbound shipments on schedule. In addition to monitoring remote activity, iTrade Field Load captures all Critical Tracking Events (CTEs) and includes PTI traceability compliance from the very beginning of the fresh supply chain. Access to increased data facilitates unloading, optimizes inventory movement and provides advanced data to appointment loading systems, allowing inventory managers to unload trucks faster, reduce essential cut-to-cool times and streamline the inbound receiving process. See the other growers and shippers who chose iTracefresh for traceability.